While it may look like I spend all my time writing and talking about construction, I still swing a hammer most days. It’s hard to pinpoint when I officially started a career in construction because it wasn’t planned. When I was 7 my parents (non pros) built their own house. It was my job to nail off the subfloor, stain boards and pick up and straighten out nails laying around the building (I got 5 cents for each straight nail I returned to my father). And growing up there was always work to do around their 20 acres; building car barns for my father’s antiques (junk), rerouting streams with a backhoe, clearing trees and fixing everything I busted (tools, cars, machines). I dropped in and out of college 6 times between 1977 and 1984. Answering a help wanted ad in 1980 for a ‘carpenter’s helper’ after bolting mid-semester started me down a different path though it wasn’t obvious immediately. I worked construction summers and weekends when I dropped back in school to support myself. While working on a masters of education I was offered a teaching job starting at less than I was making part time in construction; I went for the $$$. In the late 80’s I teamed up with Rick Arnold to form a spec and custom home building company, and a framing and finish carpentry company with about 10 employees. But neither of us was cut out to be an employer and disbanded our workforce by 1997. Rick got into concrete construction and I teamed up with my brother tackling one custom house a year and several remodeling projects. Bruce and I tackled everything on our projects from foundation to finish except for licensed trades (electric, plumbing, mechanical). 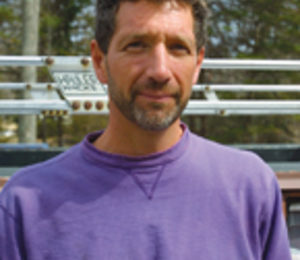 “To me, green building is business as usual,” says Mike Guertin. Guertin’s green building career began in the mid-’60s when he was 7 years old. His parents tackled the ultimate do-it-yourself project, designing and building their own home. While most kids were building tree houses, Guertin drove subfloor nails, spread stone for footing drains, provided general labor, and tended the plumber’s lead crucible (hence the brain damage, he jokes). The house was simple in design, efficient in resource use, and sported state-of-the-art energy features: R-11 insulation, double insulated windows and glass doors, and a compact/hot roof design with asphalt-impregnated fiberboard insulation. Teaching, not building, was Guertin’s chosen career. But though that lead to stints at an environmental education center and high school science department, neither gave him the satisfaction he felt working with his hands—framing, roofing, and siding houses during his college summers. So Guertin left teaching for construction. Our top-notch editors are, first and foremost, experts in their fields. Along with their commitment to quality design and construction, they are former builders, remodelers and architects. The advisors are a diverse team of green building professionals and industry thought leaders committed to contributing to the information and insight on GreenBuildingAdvisor.com. Предлагаем купить анаболики у нашего менеджера.